Samsung to launch Galaxy Note 8 to launch on August 23. 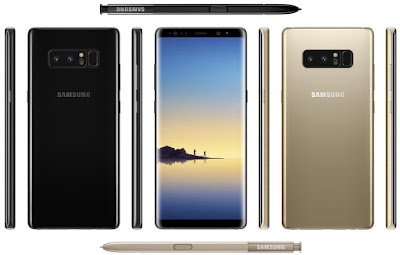 Now Renders of Samsung Galaxy Note 8 leaked in Midnight Black and Gold color with S pen. Samsung Galaxy Note 8 will have a 6.3-inch device, with the same edge-to-edge, 18.5:9 aspect ratio AMOLED display as in the Galaxy S8 lineup, Note8 will utilize the same top-of-the-line Exynos 8895 and Qualcomm Snapdragon 835 Processor. Samsung Galaxy Note will be Samsung's first phone with dual cameras on the back, each of which features a 12-megapixel sensor and independent optical image stabilization for the lens. The lenses are said to be configured horizontally, situated to the left of the flash and heart rate sensor.Fingerprint Scanner Similar to Galaxy S8. Packed with a 3300mAh battery.There will be improved -use of split-screen multi tasking endowed the S Pen with more capabilities (such as full-sentence language translation and currency conversion) and added the ability to pin handwritten notes to the always-on display. DeX capability is also included, as the Note8 is said to be compatible with the same dock which was announced with Galaxy S8.